Mail4Rosey: The Beginners's Bible 4-Disc Set on DVD: Great Price! 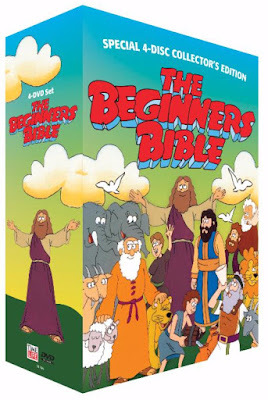 The Beginners's Bible 4-Disc Set on DVD: Great Price! This is a great DVD set to place under the Christmas Tree this year for your little ones. Putting the most well-known and beloved Bible stories into a format that's easy-to-understand and fun to watch is a great way to help your children grow in their faith. I think this would be awesome gift idea for outside of the home too. My first thought was the Sunday School teacher. This be a nice way to say, 'hey, I appreciate you.' It'd also be fun to offer in a gift exchange. Even better news? It's extremely affordable. You can purchase this set on Amazon for just $23.99. That's a great price, for an awesome set of DVDs. Created for families to help share the most important lessons from the greatest stories ever told, THE BEGINNERS BIBLE COLLECTOR'S SETis a delightful and acclaimed way to introduce young children to the Bible's timeless stories of inspiration, courage and faith. Featuring an original theme song from Kathie Lee Gifford, memorable songs, vivid animation and heartwarming characters, this 4-disc collector's edition brings the true wonder and joy of the Bible to life. And told in a non-denominational way that has been accepted by all major denominations and ministries because of its simplicity and warmth, the set features 13 age-old classics, in both English and Spanish, including "The Story of Easter", "The Story of Moses", "The Story of the Nativity", "The Story of Noah's Ark", "The Story of Creation", "The Story of David and Goliath", "The Story of Jesus and His Miracles", "The Story of the Good Samaritan", "The Story of the Prodigal Son", "The Story of Joseph & His Brothers", "The Story of Daniel & the Lion's Den", "The Story of the Battle of Jericho", "The Story of Jonah & The Whale"
These would be a great Christmas present for my son! Be a good way for one to learn indeed. I think this would be a great way to introduce your child to religion. Television can be a great learning tool, so putting this on disc is pretty smart! We have one of the discs... and love it. Great way to learn and share. That is actually perfect for all the first communions coming up in the spring. What a nice set. This is a great way to help your children learn the Bible. There are so many amazing stories that most kids never hear. This sounds great for introducing young kids to the Bible! I will look into it when my daughter has her baby. This is a great gift for little ones (and some older ones). I love videos and books that help inspire my girls to love and learn about the Bible. This is a great gift for any of the kids in my family. I love it. The reason for the season! I'd love to have this DVD. My kids have a little book with a handle made by the same company. It's great. I want to get this for my granddaughters. This is a fun way to learn about the Bible. These sound great! My kids would really enjoy these. Definitely something that would be loved in our home. This looks great! I have some similar to this from when I was little that you can't find anymore - always good to have them in the collection! This DVD set would be a great Christmas gift. I will have to share this with my friends with little ones.